Looking for a world-class luxury SUV with the look and feel of a European sport sedan? 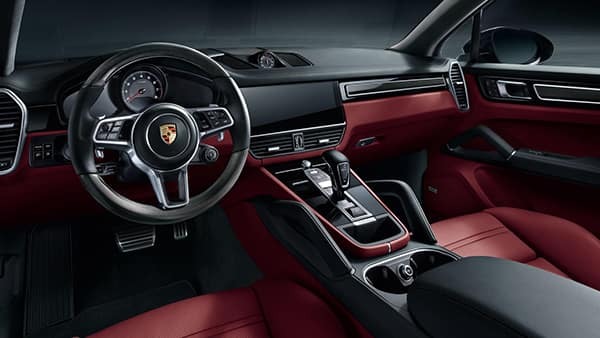 The 2019 Porsche Cayenne is for sale now near Los Angeles at Rusnak/Pasadena Porsche in Pasadena–and it’s been completely redesigned. See what the expert consensus is on this all-new luxury SUV, and then check out the Porsche Cayenne lease offers going on now! From its standard all-wheel drive (AWD) system to a suspension that smartly toes the line between sporty on-road and capable all-terrain performance, the all-new Porsche Cayenne is a genre bender in the best ways imaginable. Curious about the 2019 Porsche Cayenne price? Apply for financing online and then check out our online payment calculator to estimate your monthly payments. Compare the Cayenne to the Mercedes-Benz GLE, and to get a closer look at the new Cayenne SUV, stop by Rusnak Pasadena Porsche today. Our doors are open seven days a week! Contact us if you have any questions!